At Les Pres D’Ondine, our spa and wellness center is a true oasis of tranquility. It sits peacefully in a secluded wing of the hotel where only the sound of bubbles and serenading music can be heard. The center looks out onto our luscious green garden that greets the flowing river. 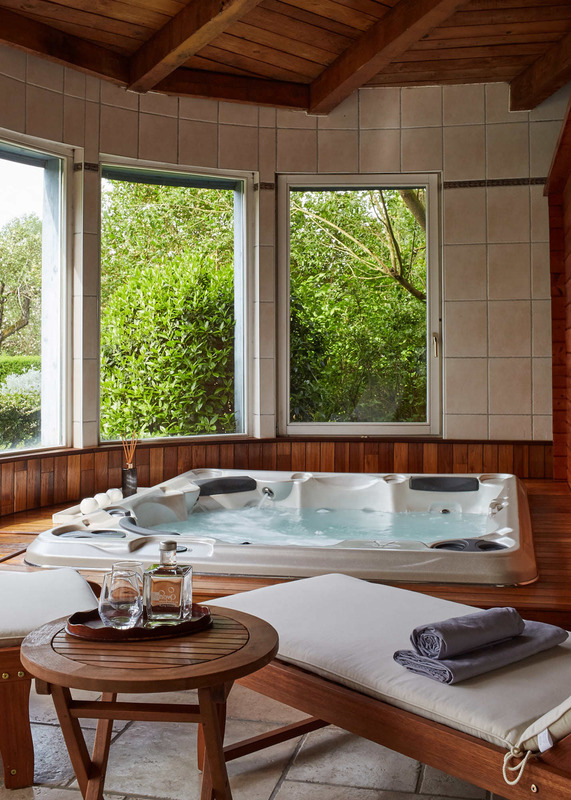 The spa is equipped with a Jacuzzi, sauna, showers and an array of relaxing massages. The Jacuzzi and sauna are free of access to the guests of the hotel from 10am to 7pm everyday, we also rent the spa privately from 10am to 5pm for €10 per person per hour. Please ask us about our massages and we will be glad to book a session for you in advance. Chinese Massage - Our Chinese massage is an energising treatment that focuses on stress relief and soothing any tensions. This massage is ideal for appeasing back pains, tackling breathing issues, emotional or physical stress or for an overall feeling of well being. The Chinese Massage lasts 1h30 minutes and costs €95. The treatment is from head to toe. Lomi Lomi Massage - The Lomi Lomi is a full body and face massage which uses relaxing oils. The technique is inspired by Hawaiian waves that wash gently against the shore. The massage is unwinding , harmonising, stimulating and nourishing. Thus, leaving the body feeling de-stressed, light and glowing. The Lomi Lomi Massage lasts 2h and costs €125. The treatment is from head to toe. Energising Treatments - This treatment is inspired by the Reiki. Reiki is a Japanese technique for stress reduction and relaxation that also promotes healing. The massage is focused on revitalisation and restoring a good balance throughout the body. The Energising Treatment can last 1h or 2h depending on your personal needs. The price ranges from €65 to €125. Massages Coconut scent from the Maldives. Prestige Hindu Face treatment with Indian Rice + Hindu scrub 30min + Back Massage30min. With wrap is an additional 30min at 30€.